In part 1 of the Diablo 3 Witch Doctor Leveling Guide, I provide a broad overview of the witch doctor class. In subsequent installments, I will be discussing more specific information and strategies for fast witch doctor leveling in Diablo 3! The witch doctor is notorious for his or her command of dark magics from beyond our world. Witch doctors are elite members of the Umbaru tride and are said to have a spiritual connection with the afterlife, which they refer to as the Unformed Land. Tormented by the cries of those souls lost in atrocities long past, the witch doctor is in a constant battle to rid this world of its evils and prevent future suffering. The witch doctor calls upon a vast array of devastating curses, hexes, minions and magics while leveling through the world of Diablo 3. Able to conjure armies of zombies, spiders, toads, mongrels and other terrible creatures, witch doctors distract their enemies with these vicious pets while unleashing their own magical abilities on their unsuspecting foes. Some of the signature abilities of the witch doctor class are poison clouds, exploding corpses, swarms of locusts and terrible firestorms. Skilled in the dark arts of curses and hexes, the witch doctor can also greatly weaken their enemies to ensure victory in battle. In addition to the spell-casting and summoning abilities, the witch doctor is also fairly adept at melee combat, which makes this class a very well-rounded choice for easy Diablo 3 leveling. Many of the witch doctor’s abilities seem to harken back to the necromancer class of Diablo 2, which many found to offer an exciting alternative style of gameplay when compared to some of the more traditional classes such as barbarians and wizards. Interestingly, the witch doctor is the only class in Diablo 3 that uses mana as their primary resource. Unlike the limited but quickly-regenerating arcane power of the wizard, the witch doctor’s mana is a vast pool of spiritual energy that regenerates quite slowly over time. As a result, the witch doctor must plan their large, mana-intensive attacks carefully to ensure they don’t find themselves depleted during the heat of battle. The benefit of the witch doctor’s slow to regenerate but large mana pool is that they are able to launch enormously-powerful attacks at a moment’s notice when they have a full supply of mana. This will allow for wide-spread battlefield carnage potentially unrivaled by other classes. The witch doctor has several interesting items that are unique to its class. Their off-hand item, containing magic-enhancing stats, is called a Mojo and their unique mainhand weapon is called a Ceremonial Knife. Other weapons able to be wielded by the witch doctor are one-handed axes, one-handed daggers, one-handed maces, one-handed spears and one-handed swords. Additionally, they can use two-handed axes, two-handed axes maces, two-handed axes polearms, two-handed axes staves and two-handed axes swords. As for armor, witch doctors begin the game with simple tribal bodypaint and a scant covering of cloth and fur armor. As they level, they gain access to metal armor plating and, ultimately, highly-ornamental and protective armor suits adorned with skulls, horns, and feathers. The witch doctor’s unique piece of armor is the Voodoo Mask, which in my opinion is reason enough to select this class as your first character to level in Diablo 3. The Voodoo Mask allows for extremely interesting and threatening gear visuals and clearly goes far to define the unique look and style of the witch doctor class. 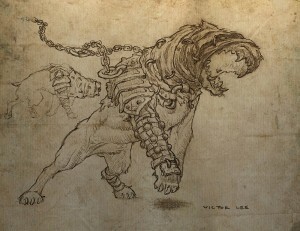 Pets are another one of the signature features that sets the witch doctor apart from other classes in Diablo 3. The witch doctor is able to summon and command vicious swarms of locusts, savage packs of mongrel hounds, flesh-eating zombies, and all manner of creepy vermin. Witch doctor pets serve both as an offensive, damage-dealing ability as well as a viable defensive ability. The witch doctor may send their pets to attack a group of enemies, letting the pets take the vast majority of the damage and abuse. This gives the witch doctor the chance to either make a hasty escape from dangerous situations or send in a barrage of their own powerful magic to help destroy the enemy.